At this point, I had pretty well decided to devote the majority of my drawing time to comics about my job during the next school year. Believe it or not, one of the big deciding factors for this was being told I would have my own classroom in the 2009/2010 school year. Although it barely comes across in the past year’s worth of strips, I thought it would be better to do a strip with more background continuity than I would have had if I was still a traveling teacher. Sometimes I do comics just for me. They’re not a story, they’re not funny, they’re not anything except me trying to remember something. This is one of those comics from one of my classes in 2008; a very weird choice of words from one of my students on a snowy day. Again, this was just one of those moments in a classroom that I liked where my students and I were just shooting the breeze. I’d like to try and do more comics like this one next year; I worry that I get a little too “explain-y” with my strips sometimes. When I say being a floating teacher was great, I could have probably gone into more detail. I think I did a VERY good job that year, keeping lessons interesting and varied while still running a marathon up, down, and across that building for nine and a half months. I also realize that people cut me a lot of slack. I didn’t have the same types of evaluations as other teachers did because of the constraints I had on my time and environments. 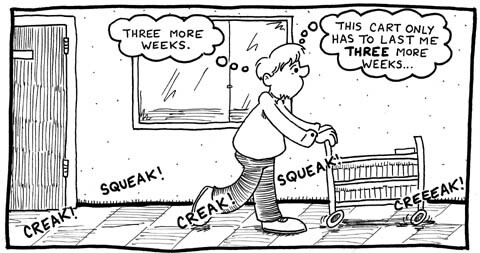 It’s hard to give someone advice on their classroom environment when it changes six times a day. The teachers with whom I shared my classrooms with were, in a word, spectacular. They were helpful and nice and only one was outwardly resentful at having to breathe the same air as me! Honestly, I would use the classrooms of teachers when they had their prep periods… can you imagine? You’ve got 40-odd minutes of peace and quiet on your schedule and IN walks Mr. Loud from New York City and disturbs your much-needed calm time! Anyhow, there was something about this part of my life that was too big for my sketchbook. I had to get out a piece of Bristol board and chart the whole day out… and that was, I think, another important piece of bringing together all the elements into the teacher comic I’ve been doing for the past year. Howdy, folks. I’m posting this from Long Beach Island, New Jersey where my family and I are spending the week. We rented a house with, among the many amenities, a wireless connection. I’m drawing a ton of comics in this new sketchbook I bought that I’ll probably post here in upcoming weeks, despite the fact that none of them have anything to do with teaching. I thought I’d take this week to post a couple more old comic strips I did back in 2008. They’re not the best comics I’ve ever done, but they’re notable in they really show the genesis of the past year’s worth of teaching comics… and hopefully they’ll inform the year to come as well. I’m guessing there’s a very slim amount of folks out there who are interested in such things, but I’ll take the chance. This kind of thing still drives me crazy, when someone will hijack a meeting to pontificate about their own greatness as an educator to the expense of both the momentum of the meeting and the patience of those stuck in the meeting. I’ve known a lot of people who do this and honestly… I get why it’s done. You want to get the word out there. You want people to know you’re a good teacher who thinks about their craft. It makes sense. I just don’t have time for it. I drew this in a sketchbook and didn’t ever expect to post it. There’s no backgrounds. It’s very shoddy. I drew it more as a reminder to myself NOT to act this way in meetings, but there was something about it that I liked, even the cussing… which is something I don’t normally do in my comics. I liked the confessional aspect of the strip and I guess this was the first step down the road toward doing the types of comics I’m doing now. 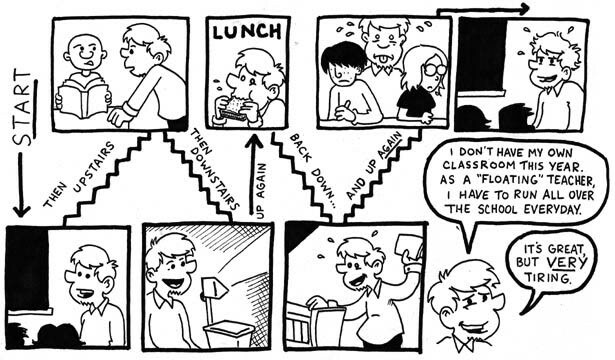 I wasn’t doing teacher comics regularly last year, but this is one that came up at the end of ’09 that I really liked. I still like the general concept of the comic enough to repost it although I think I may have come at the concept from a different angle if I had done it this year instead of in 2009. 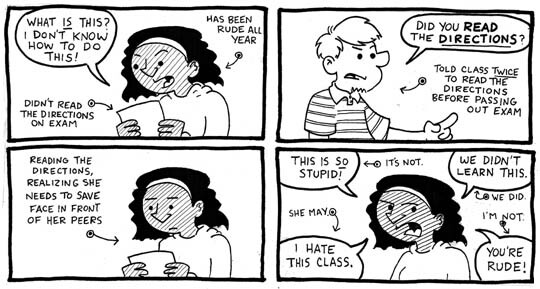 All the “rude” talk sort of stings, even if in this particular case, the student was one of the more rude teenagers I’ve worked with since moving to Ohio. Here’s a comic that IS a Thrift Store Find! 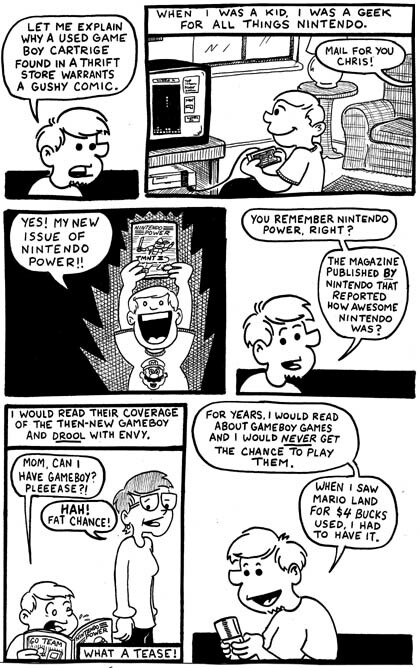 Strangely enough, I currently have a subscription to Nintendo Power for my classroom. It’s a little less biased than I remember, to the point where they do give out bad reviews now and then. 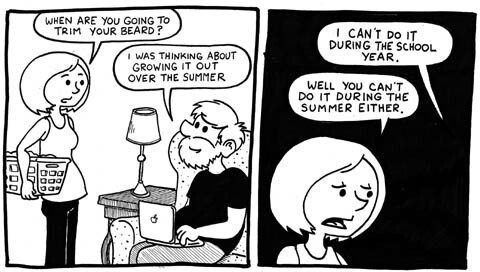 I’m digging through the archives this week, posting some comics I liked that were drawn around this time last year. They’ve never been posted to this journal! Today’s my second wedding anniversary! Ellen, I hope you’ll be the boss of my beard forever. You are currently browsing the Teachable Moments blog archives for July, 2010.